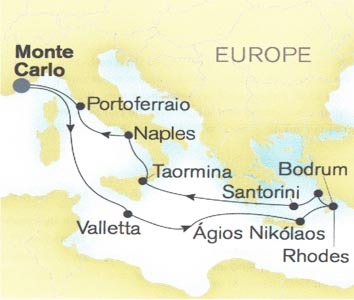 We have spent a delightful 12 days on the Silver Spirit, we started the cruise from Monte Carlo. She looked really fantastic as we drove into the harbour. Within no time we were on the Silver Spirit and enjoying a glass of champagne. We were then able to explore the ship and found ourselves sitting on the pool deck now drinking cocktails and enjoying lunch. Our suite was ready at 3pm and our butler introduced himself with yet more champagne and canapés, he was very informative and showed us around the suite and offered to make any dinner reservations that we required. The staff were very helpful and friendly and made a point of asking your name and always remembered you. There are several restaurants that you can visit, our favourites being Hot Rocks and Stars a really unique experience where the food and service was fantastic. We went on three excursions all were very good, very well organised, very informative and we went to many places that we would never have found.